This Large Chrome Syringe commands respect. Use it to apply lube, to administer Fleet enemas, or to squirt water for flushing. 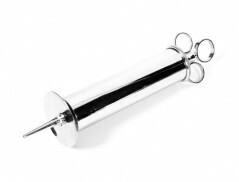 The Large Chrome Syringe is sure to turn heads and get the attention of your play partners. It can be filled with 6 ounces of fluid which can be administered with a simple squeeze of the plunger. We recommend using these to administer Fleet Enemas, and find them handy for just filling with water to be used for miscellaneous flushing. Many people find them to be a great piece of equipment for dispensing lubricant to both the body and toys. These are a great looking and are a functional addition to any medical instrument collection. The barrel is 5 inches in length and 1 1/2 inches in diameter. The 6 Ounce Large Chrome Syringe is another one those inexpensive must have additions to any medical instrument collection. They look great and are fully functional for dispensing enema fluid, water, or lubricant. At 9 inches in length and a barrel diameter of 1 1/2 inches, this will truly get the attention of any room. We love to dispense lubricant from them as it is not only very visual, but the syringe's finger grips make it easy to use and it helps keep a play area neat. Simply clean the Large Chrome Syringe with warm water and an antibacterial soap and allow to air dry.